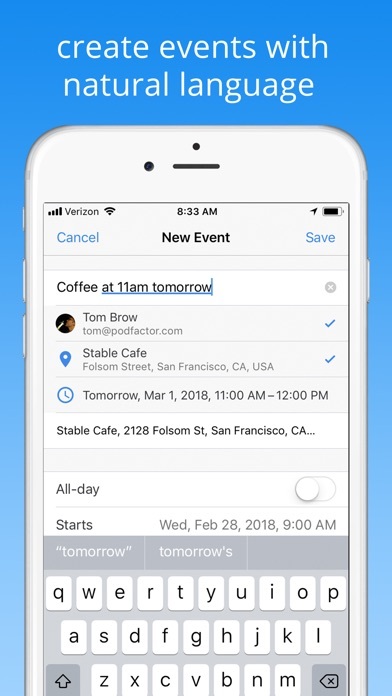 This is the simple, thoughtful app pushing the boundaries of what you expect from your calendar: - Intuitive, beautiful views of days and months - A single, unified view of events and reminders - Powerful natural language entry to quickly add events - History and context with any contact you're meeting - Supports all major calendars: Google, Exchange, iCloud, and more 100% free and does not require registration. Try it today! I like the UI of this app better than the pre-loaded Apple calendar. But this app pairs seamlessly with the apple calendar as well! You can change the colors for different things- work, school, bills, personal, church, etc. and add participants who will receive and invite to their calendar as well! Great app and easy to use! 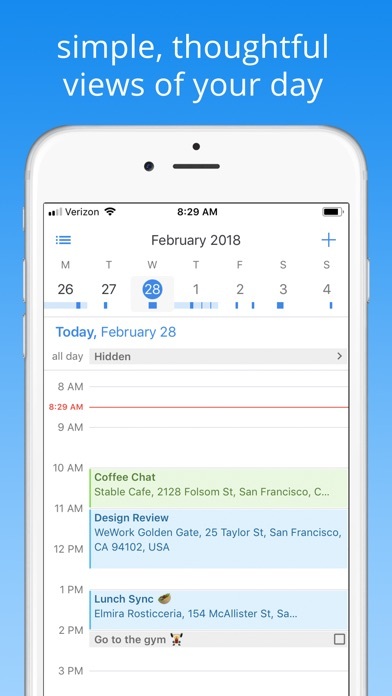 After the Apple calendar update, I started looking for a new calendar and this is the best calendar app I’ve found so far! I’ve been trying to find a calendar/planner app that shows the title of each entry each day on the monthly view. This app does just that!! I love the ease of use. There is no effort in figuring out what to do. This calendar is great for my purposes. It enables me to see how my day appointments stack up and where the overlaps are going to cause me issues. I'd love greater ability to change a few settings (force day view to only show 7am and after, etc). A week view would be nice. The reason I gave it 4 stars is because of my “OCD”. It would be the best organizer app for me if I could manage the order in which the All Day events from different calendars appear in a day. It would be nice if I could arrange the Calendars by importance so that All Days events appear in a certain order in a day. 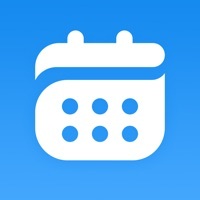 This is the only app I’ve found that basically just combines Apple’s calendar and reminders apps into one app for free. No frills, no confusing or overcomplicated interface, just pure organization. It’s aesthetically pleasing while still being simple and has multiple view settings to suit your individual fancy. It’ll even tell you how much time you have between two events or reminders, which is supremely useful. I honestly don’t have a single problem with it. Great app. This app is way better than any of the other hundred i’ve downloaded before. 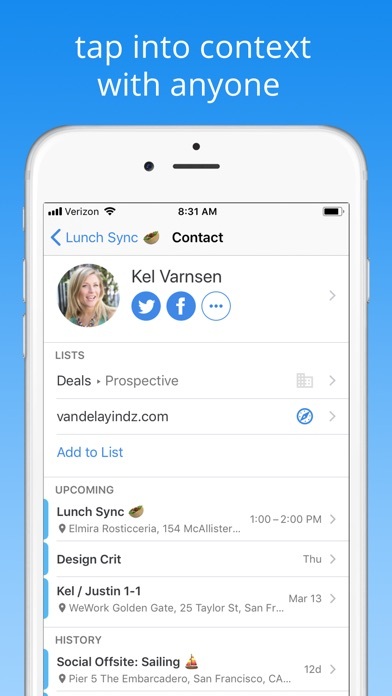 It makes scheduling easy and simple so what more could you want?! I have been using for about a week. I like the app because I can see what’s on my schedule at a glance without tapping windows too many times. I also like the color contrast. It was so easy to set up. Only took a couple of mins. This app is very intuitive and easy to navigate. This is my new Calendar app. Thank you Developers. Just what I’ve been waiting for! I thought this would be a separate app calendar but it won’t let me use it unless I connect it to my calendar that’s in my phone. I love “pod” quite a bit. It’s simplicity, ease of use and intelligent design makes this app quite nice. It is really visually intuitive and appealing. However- there are glitches. The “keep in touch with the people you meet” part of the app doesn’t work. 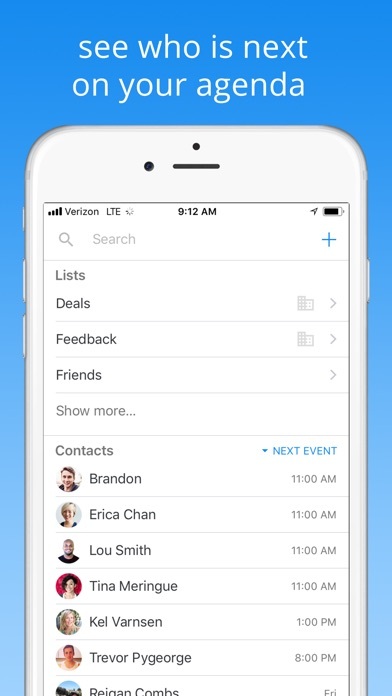 You can link contacts and add participants but you cannot do what the preview slide suggests. Pressing on a linked or added contact does nothing. I also don’t understand why there are two calendar symbols in agenda view. One is top right the other is bottom left. They both take you to “Today”. Finally, it would be nice if we were able to link not just contacts with email addresses but those with phone numbers to events. And, in the contacts section it would make sense if we were able to access all contact information. Also- linking event address/location search to our contact list would be a great addition as well. Keeps the info I need in order and is easy to set up, use, and find things. Intuitive and simple. Works great. So far, this app seems to work fine and offer everything I need except a way to schedule repeating items on the 2nd or 3rd Wednesday of every month. Besides that, very nice . Perfect for what I need. I like the layout and the clean look. Very good app! I have been looking for a long time for an app just like this one. Simple and minimalistic. 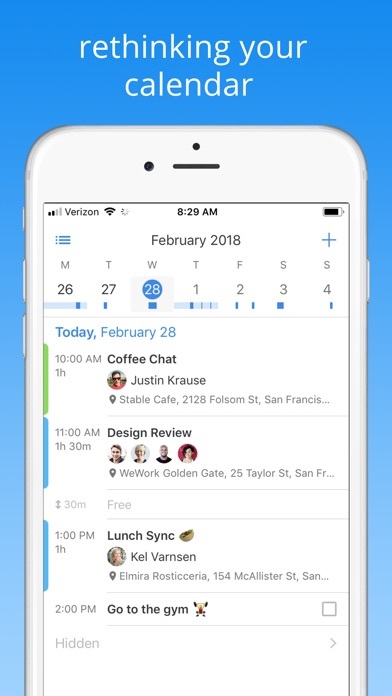 If you love simple , then this is an app for your Calendar needs. This app is amazing. I love all the options you can have it as a monthly, weekly, or daily calendar. I use the monthly, I love how you can see your plans without having to tap the actual day. I highly recommend this app to any person that needs an organized calendar app. 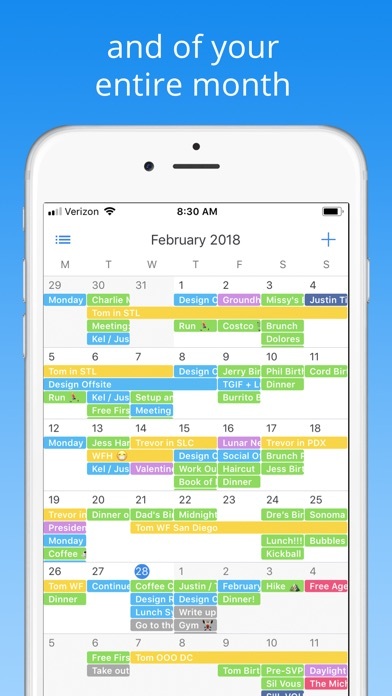 This calendar works very well and suffices my needs, but the addition of a custom color coding option would greatly increase not only my productivity but my appreciation of this app. Just downloaded it and everything seems great. I just wish there were more color options. So I could color code my events. Great app, easy to use! 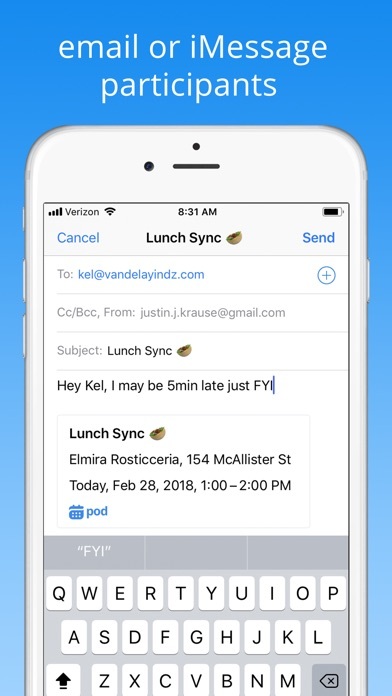 But i wish i could sync mine and my husbands (he has the same app as well) so that we can see each other’s work schedules and events! Much better app than the original calendar app from Apple. Easily beats out the 4 calendar apps I tried before this one. Love it. So easy to maneuver and visually pleasing. This is a great app! 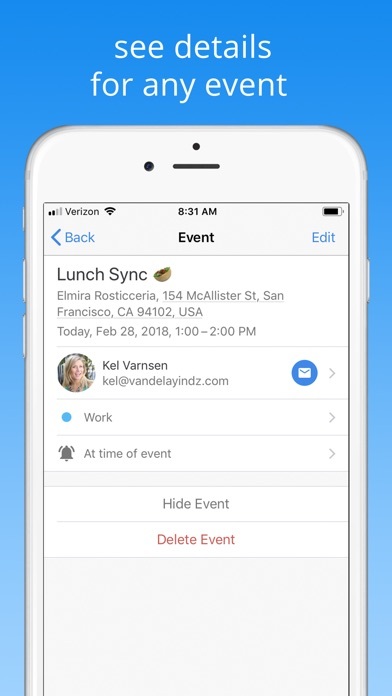 It is easy to use and highlights the days where you have events. It also shows your entire day. Seeing Monthly makes organizing easier. I was looking for an app good for organization because I’m an organized person. I’ve had many organization apps before, but nothing like this. Easy to use with dark mode. Simple and professional. this is it!!! this is the last time I download this app. I've downloaded Pod several times before, but then get hooked by another app and jump ship. this app is perfect. I love the look and it handles my info seamlessly. Great app! Question. Is there a way to share my calendar with another person? The “Invite” function doesn’t work for me (if that’s even what that part is for). I use this app daily. I live by it and would be lost without it. I do wish that there were more Default Calendar Settings. There are I think 5. If you could add more types of events. With other colors it would so much more helpful for me. I have to keep up with my mom's appointments also. There may be a way but I'm not finding it. I would like to be able to to see all of her appointments in a color just for her. Maybe you could help me if I'm missing it. Otherwise I LOVE it. I wish I could change colors for events not just in my calendar. If I have multiple events in one day, they are all the same color as my email calendar. I tend to overlook it. This app is the best I’ve seen so far. The only thing I’m not sure I see is calendar invite through text. I’m not sure if it’s available on any app as yet though. I find myself on this app a lot. It really keeps me organized. Between my 2 jobs, family, and many personal appts. This app lets me lay everything out and easy to see in a quick lay out. Easy to use. Just what I was looking for. 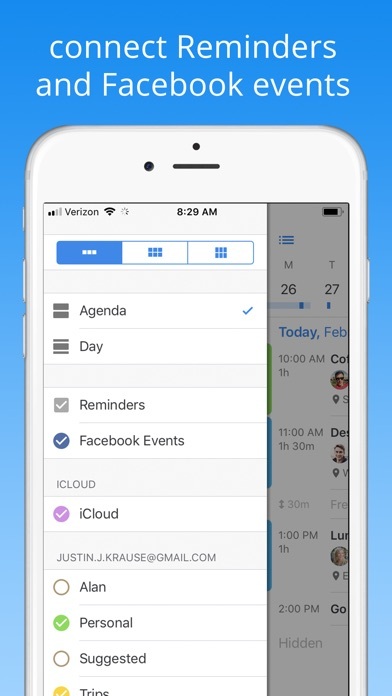 Better looking calendar than Apple’s, and appears to have the same functionality. My only suggestion is to change the icon so that it displays the date. You can set it to give a badge notification with the date, but it looks like waiting messages. Nice layout and feature set. No ads or registration! The layout is good and clear. Would be better if I try would download Outlook calendar and enable have color entries. Really like it.